My first long race of the year – the Dances with Dirt Green Swamp 50K – is just two weeks away, and I can hardly wait. Not only is it my first-ever spring ultra, it’s in Florida, where I hear the weather is actually above freezing. 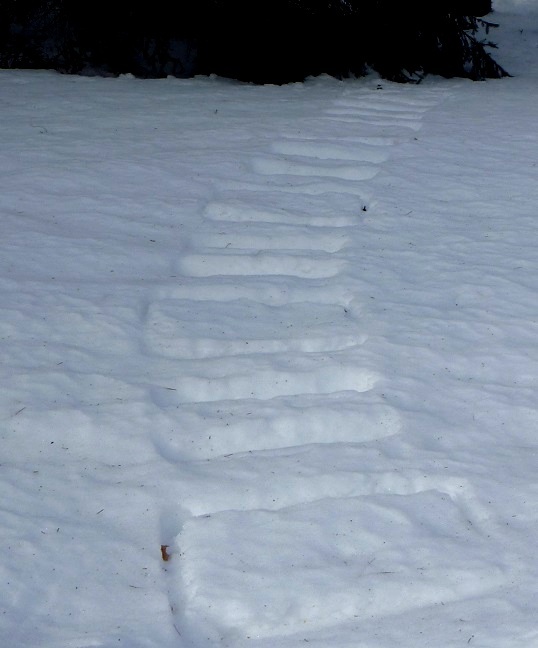 Winter riddle: What caused these mysterious tracks? Answer at the end of this post. I’m currently running around 30 miles per week, Saturday’s group run being about half that, with shorter runs and speedwork mixed in. This is actually a bit light; many in our group are running 40-50 miles or more per week training for Boston. But with snow shoveling, Aikido, and my twice-weekly torture sessions added, I think I’m in good shape. But physical fitness is just part of preparing for a race. There’s also how I plan to eat and drink before, during, and after – what the running world refers to as fueling. And boy, is there a science to it. Food becomes reduced to its constituent elements – protein, fats, and carbohydrates – presented as pills, powders, gels, and bars, while liquid intake is concerned with electrolyte balance and hydration. And, naturally, there are several wonderful companies that have exactly the right products for you to run your next race like Superman. So good…and so good for you! I got some insights at a recent nutrition clinic hosted by the Ann Arbor Triathlon Club. An ultramarathon, like a triathlon, is an endurance event, and the rules for getting the right stuff into your body at the right time are basically the same. So I signed up and drove through a snowstorm to learn all I could. I’ll save the gory details for another time, but here’s some highlights. Don’t try to replace the calories you burn during a race, or even all the water you lose. The human body is designed to operate without food while running, and eating or drinking too much can make you sick. Look to replace no more than 240-280 calories per hour, and drink to your thirst. Don’t overdo the sugar. Glucose is what the body uses for fuel, but the stomach can’t handle too much simple sugars at once. Complex carbs are much easier to handle, and tossing in a little protein helps even more. 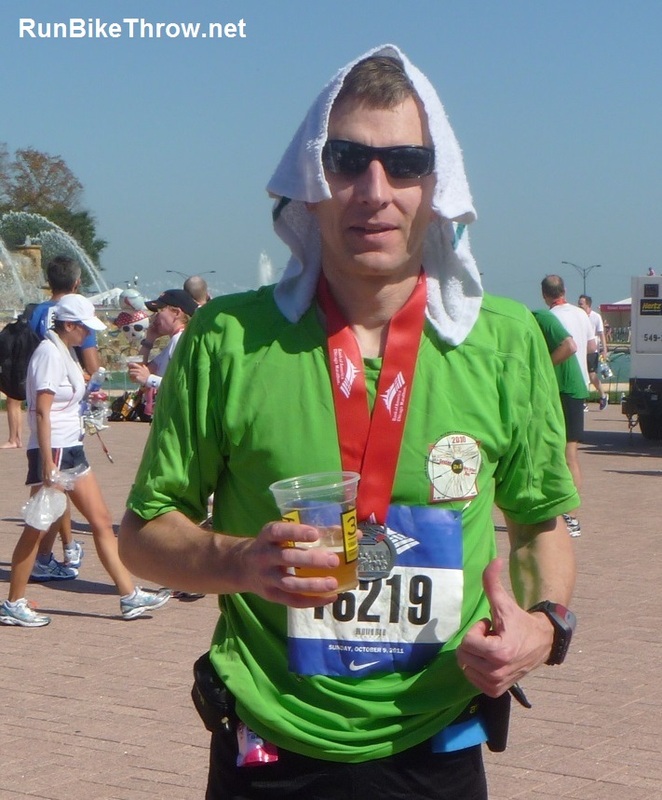 Chicago Marathon recovery = cold beer and cold wet towel. Both were great! Just as important as how much to eat and drink is finding out what you can and cannot comfortably consume. So I’ve been experimenting with different foods and amounts during my long training runs. One interesting finding: eating breakfast before the run doesn’t seem to make much difference, as long as I eat properly during it. My marathon nutrition book says a quick bite just before the start can help, and that seems to work okay for me too. For my two road marathons I subsisted mainly on Gu gels and Gatorade, and by mile 20 I couldn’t stand the sight of either of them. For the trail ultras and long training runs, I’ve had more substantial food with no digestive issues. 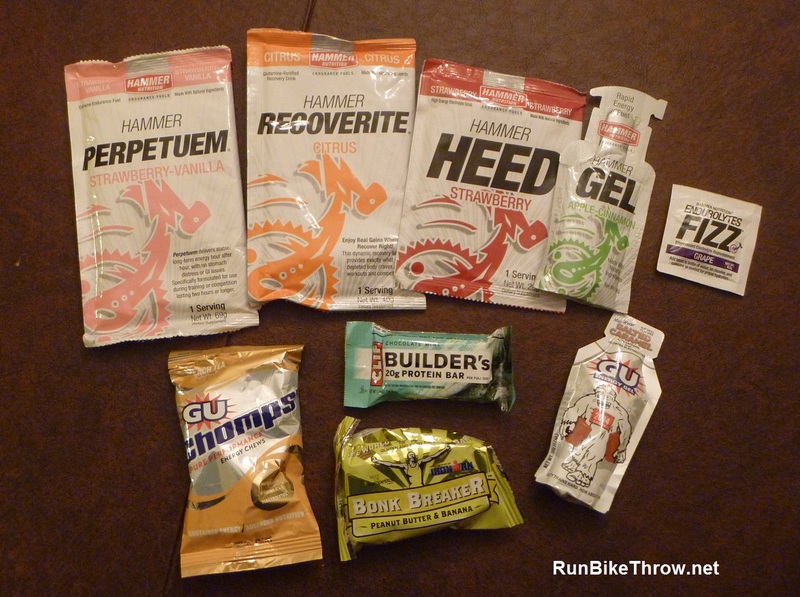 Bonk Breaker bars and Gu Chomps (not the gels) seem to work particularly well. At 15 degrees it’s challenging to gnaw my way through them, but I get there. Next up: Florida in March…what will I wear to the race? The short answer is “prepare for anything” but I only have so much space in my luggage. 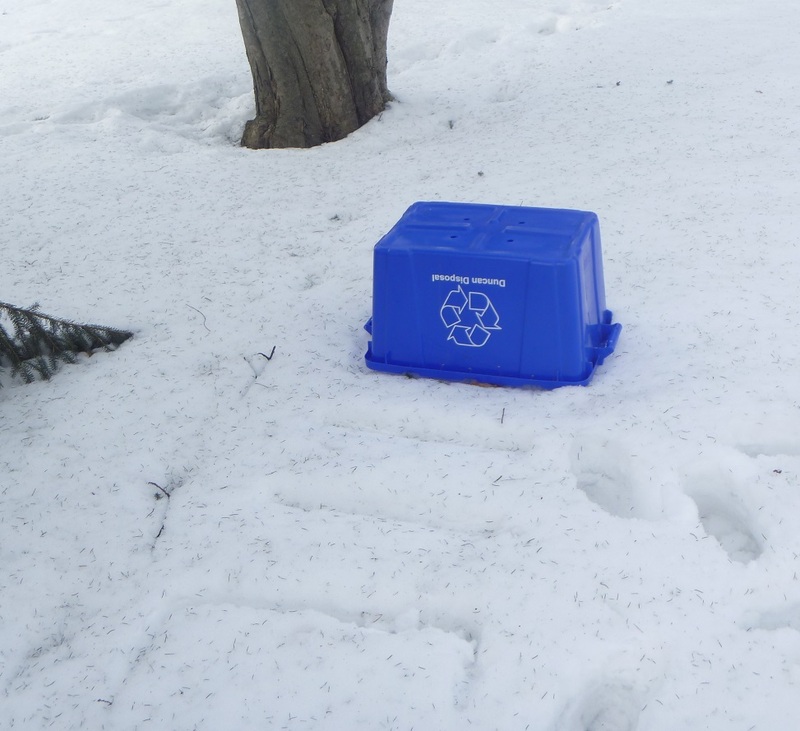 The culprit – the elusive recyclables bin! Yep, the wind was that strong on Saturday. 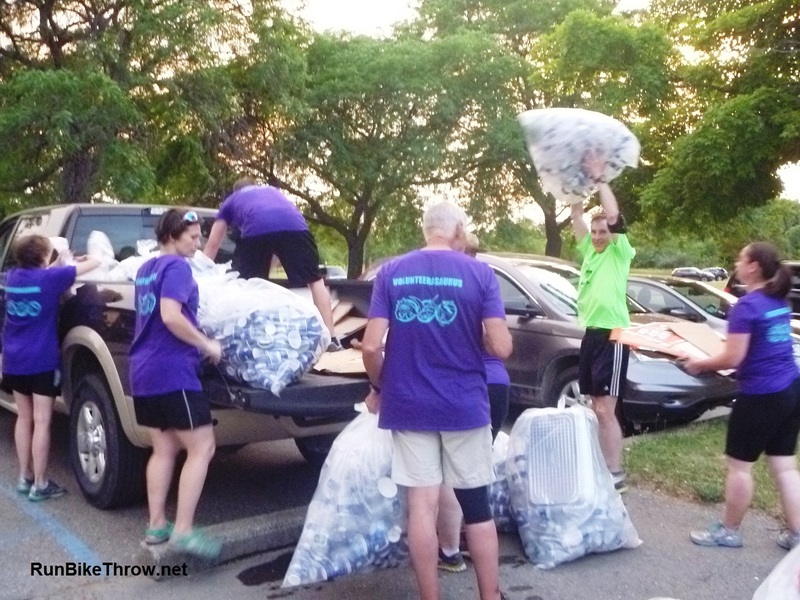 This entry was posted in Running & Cycling and tagged 50, 50K, Ann Arbor Triathlon Club, Dances with Dirt, fitness, fueling, nutrition, Running, triathlon, ultramarathon. Bookmark the permalink. Where in Florida is the race? I have one outside of Tampa at the end of March. They’re already seeing temps in the 80s where I’ll be racing. The race is in at Withlacoochee River Park in Dade City. Last I checked it was in the 60s there. The big unknown is rain. Hopefully one backup set of race clothes will be enough.